The Emblem is one of the main symbols of the state. The history is an evidence of the fact that the nomads of the Bronze Age that inhabited the territory of modern Kazakhstan identified themselves with a special symbol which is called totem. Its graphical expression further got the name “tamga". This term has been for the first time used in the Turkic Khaganate. 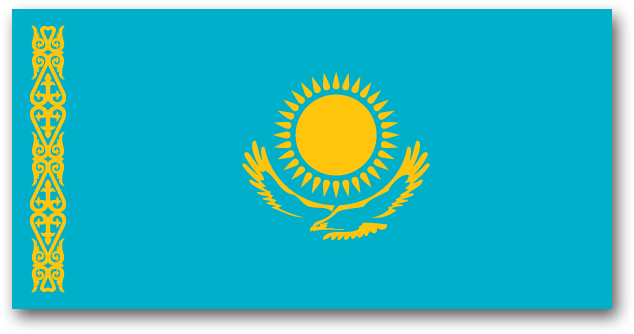 The Emblem of the sovereign Kazakhstan was officially adopted in 1992. 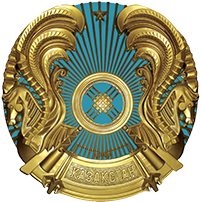 The authors of the State Emblem are Kazakhstan's famous architects Zhandarbek Malibekov and Shot-Aman Ualikhanov. The central heraldic element of the State Emblem is the image of shanyrak (an arched cross-shaped top of the Kazakh yurt) against a sky blue background which irradiates uyks (supports or bearings of the yurt) in the form of sunrays to all sides. On both right and left of shanyrak there are images of mythical winged quarter horses. At the top of Emblem there is a volumetric five-pointed star. There is also the inscription “Kazakhstan" at the bottom of the Emblem. The images of shanyrak, uyks, and mythical horses, as well as the inscriptions “Kazakhstan", have the colour of gold. In centuries past the horns are often used during ceremonial rites of nomads as well as a finial to their fighting banners. The images of heavenly grace, fertility of the earth and the military fortune in the form of various animals' horns are always considered as integral parts in symbolic compositions of different peoples. Therefore, a winged horse with a horn of plenty is an important typological image which has deep semantic and historical roots. The Flag is one of the main symbols of the state that represents its sovereignty and identity. The Anthem is one of the main symbols of the state. After gaining independence in 1992, a competition was announced to writing of music and lyrics of the national Anthem. Following the results of the competition, it was decided to retain the melody of the previous anthem, the anthem of the Kazakh SSR. Therefore, Mukan Tulebayev, Yevgeny Brusilovsky and Latif Khamidi have become the authors of the first anthem. The creative team presented by Kazakhstan's famous poets Muzaphar Alimbayev, Kadyr Myrzaliyev, Tumanbai Moldagaliyev and a young poetess Zhadyra Daribayeva won the poetic contest. 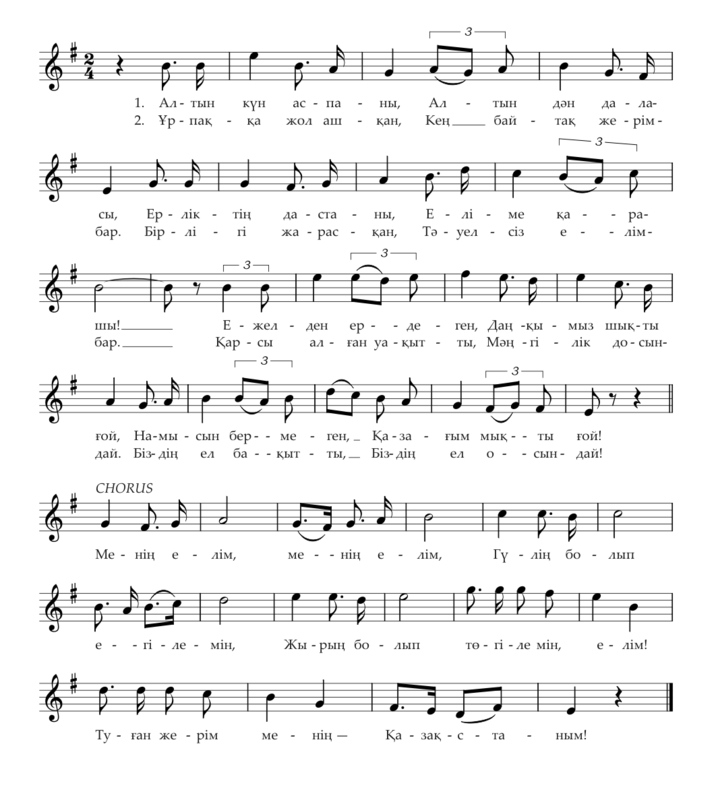 The new State Anthem was adopted in 2006 in order to promote the country's sound symbolism. It is based on the patriotic song “Menyn Kazakhstanym" (My Kazakhstan) which is popular among the people and written in 1956, with music by Shamshi Kaldayakov and lyrics by Zhumeken Nazhimedenov. President Nursultan Nazarbayev modified the original lyrics of the song. The corresponding amendments have been introduced to the Decree “On State Symbols" at the joint session of the Houses of Parliament on January 6, 2006 and the Parliament approved it as a new State Anthem of Kazakhstan.